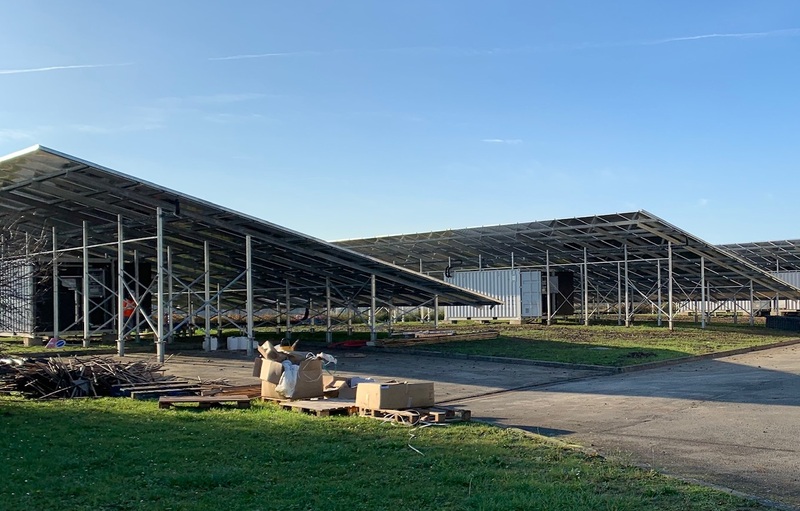 Four weeks ago, Belgian technology supplier Sunoptimo started up a solar thermal turnkey system at Lys Services, a tank cleaning company based in Merville, in northern France. The hydraulic components that are part of the 1,270 m² installation are housed inside prefabricated containers and will drain all the heat transfer fluid from the collectors installed on top of the container units should the solar loop be at risk of freezing or overheating. Considering that the system has an economic life of 20 years and that the project has benefitted from an investment subsidy and tax deductions, the cleaning business can expect the cost of heat to drop from about 100 EUR/MWh to 44 EUR/MWh. The solar thermal installation consists of four Opticubes, standardised drainback systems measuring 300 m² each. The collectors which are part of an Opticube are mounted on a special substructure and are tilted to allow for a 20-foot container to be put underneath. This container, assembled prior to delivery, houses the hydraulic components, including a solar pump station, a controller, a drainback vessel and a 10,000-litre storage tank. The Belgian business launched Opticube in December 2015 and has so far sold drainback systems in six countries. The pipes exiting the four containers lead into a fifth called Opticube Link, which supplies the combined solar energy to a heat exchanger installed in the customer’s building. Opticube is a drainback system using glycol as the heat transfer fluid, circulated by a pump in a closed solar loop. When the pump is not operating, the glycol is drained from the pipes and the collectors to protect the system from freezing or overheating. As components are drained by the force of gravity alone, an Opticube is a reliable way of protecting an installation from sub-zero temperatures on cold nights and overheating at weekends, when the tank cleaning business may close early. Glycol removed from the circuit is collected in drainback vessels inside the containers. Lys Services requires large quantities of hot water each day, between 60 m³ and 70 m³ at a temperature of 80 °C. To lower its heating bill and, at the same time, reduce its ecological footprint, it began searching for a new solution. The company now uses solar energy to preheat water and, subsequently, a gas boiler to raise the temperature to meet process requirements. A system bypass provides the required level of integration, prompting the installation to switch to solar should the temperature inside the storage tank be higher than that of the feed water. Overall, the solar system is expected to meet about 35 % of the company’s yearly hot water requirements. It will produce an estimated 500 MWh annually, at an average efficiency of between 35 % and 40 %, which corresponds to a specific yield of 394 kWh/m²a. The tank cleaning business decided to invest in an on-premises solar system without asking for money from third-party investors or banks. The investment was about EUR 800,000, or 630 EUR/m², which includes the cost of equipment, installation and piping leading to the factory. “This year, our aim is to lower production costs once again, so that we can offer 300 m² turnkey Opticube systems, including installation, for EUR 423 per square metre in Europe,” said Jérôme Delooz, Marketing & Logistics Manager at Sunoptimo. "To us, turnkey means we put the containers in place, mount the collectors on the substructure, and install the pipes running between the containers and the collectors. The only two things that need to be ready when we arrive are the concrete foundation and a link to the factory process." Lys Services was awarded a EUR 500,000 grant via French energy agency Ademe’s funding call Large Solar Thermal Installations, which has allowed the company to recoup more than 60 % of the investment costs. Likewise, it was able to use a tax relief measure, which is no longer available, to make a EUR 36,000 deduction. Without standard and additional deductions, the project came to EUR 174,000. Considering its estimated thermal output of 500 MWh a year, the replacement for the company’s natural gas system will save about EUR 20,000 annually. Sunoptimo said the cost of solar heat would be as little as 14 EUR/MWh during the next 20 years, a competitive offer in the industrial sector. The average cost of heat, previously about 100 EUR/MWh, would drop to 44 EUR/MWh thanks to the solar contribution.